On the heels of this morning’s report that Verizon is changing up device upgrade periods from 20 months to 24 months, we have a follow-up report that may lift your spirits a bit. 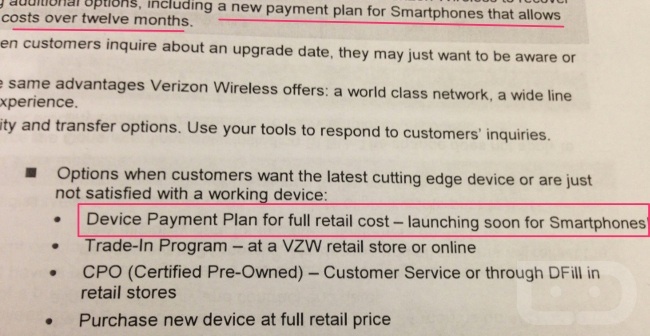 According to the document we received that appears to be a part of a training guide for this new upgrade policy, Verizon is confirming to employees that a new “Device Payment Plan” will be introduced “soon.” There is also mention of this payment plan being used to pay off the “full retail cost” of devices, an initiative T-Mobile started and is enforcing with their new UNcarrier approach. With T-Mobile, customers can sign up for service, but are not asked to sign a traditional 2-year contract. Instead, T-Mobile asks that you pay for monthly service, but also offers you the option to pick up a new device and then pay monthly installments on it until it is fully paid off. So rather than signing a contract, paying a subsidy (discount) on a phone, and feeling trapped for two years, T-Mobile lets you have some freedom as long as you pay off your phone in full. If you’d like to pay it off in full up front, it’s yours. If you’d like to pay it off over time, you can do that as well. We speculated this morning in the comments of our report that aligning upgrades with contract periods could be a sign that a situation like this is on the horizon. What we’re curious to learn now, is how this affects those of us with unlimited data plans or if it has anything to do with contracts whatsoever. Since tiered and shared data plans were introduced, Verizon was forcing you to give up unlimited data should you take a subsidy (discount) on a phone and sign a new contract. But if they are going to a device payment plan, potentially without contracts, customers are technically buying phones at full retail, which in the past has been a way to get around losing unlimited data. Verizon has yet to announce this new plan, so for now, details are scarce. 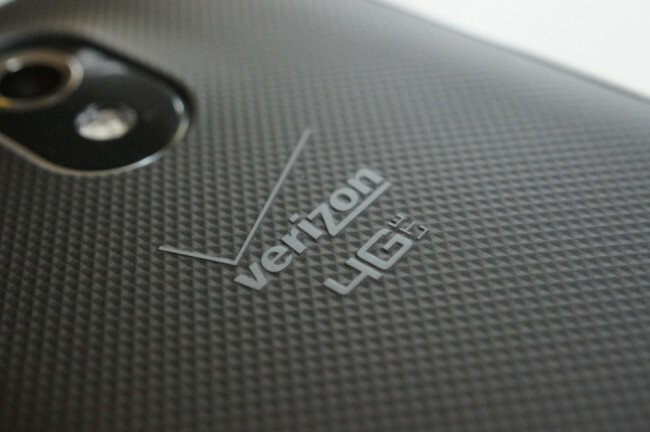 We have reached out to Verizon for comment and will report back should we hear anything. Update: Verizon made somewhat of an announcement for the Device Payment Plan, saying that these operate outside of contracts and are simply a way for customers to buy phones before their contract is up.